Are you a degree holder? 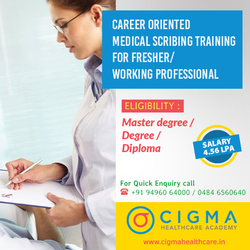 Start your new career by joining 6 months Medical Scribing Training at Cigma Healthcare Academy accredited to CPMS India and get 100% placement assurance after the course. Live Education Support - Friendly assistance with course concepts is available from a highly trained support staff. Assessment - Monitor your performance in Daily, Weekly and Monthly basis.Give separate exam preparation for the Certification Exams. No Added Costs - At Cigma, your tuition includes everything you need for success - including hardcopy books. Method of Training - Schedule your training. Select which it’s convenient for you! Online training or Onsite regular class room training or Weekend class room training. Latest materials & training methodologiesfor the training. 100% Placement guarantee with minimum salary of Rs.38,000/- per month.